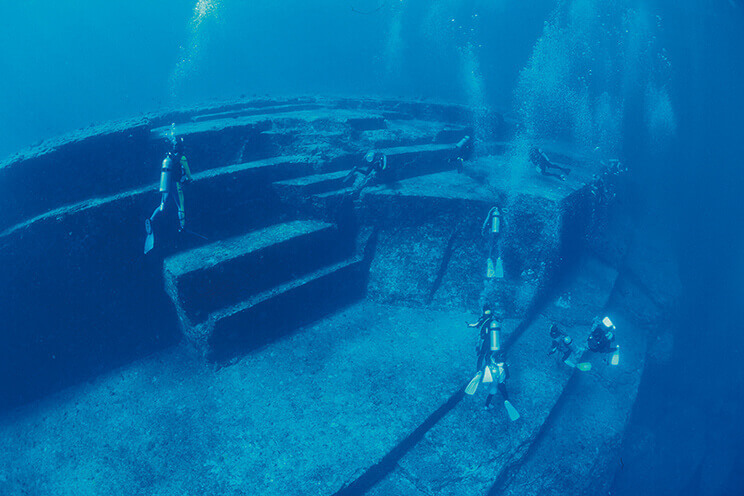 Yonaguni Island, located at the westernmost point of Japan, is an island where a unique culture and nature take root, a culture that is unlike other islands among the Yaeyama Islands. 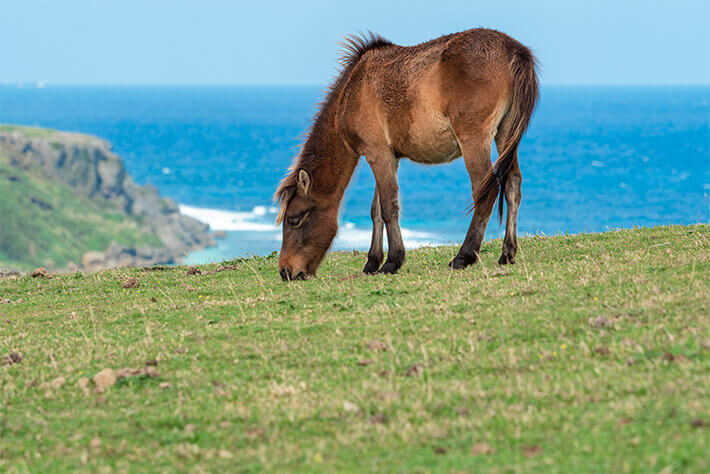 The island offers a program to experience Yonaguniori, a weaving technique using threads that have been dyed with plants, trees, and soil from the island, horseback riding on Yonaguni horses, which are native to Japan, as well as the unique experiences only available on Yonaguni Island, in addition to the DiDi Yonaguni Community Center, where you can indulge in what the island has to offer as a whole, including its traditional performing arts and local cuisine, including a diving shop. 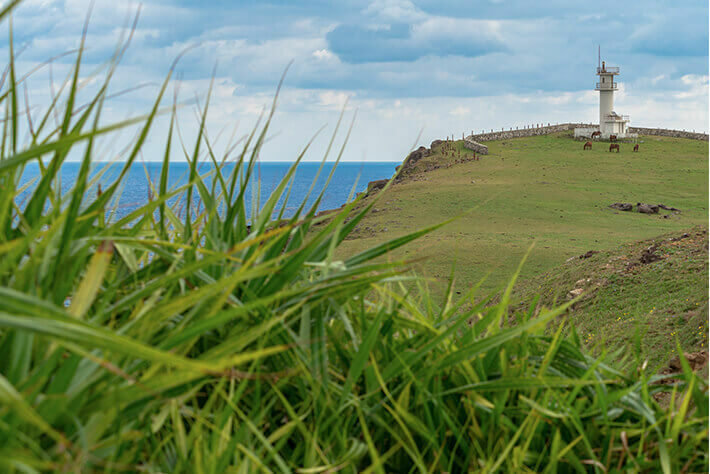 Yonaguni Island is the westernmost island of Japan, with a distance of 111 kilometers to the neighboring country Taiwan, which is shorter than the distance to Okinawa Main Island (509 kilometers). Irizaki, the westmost part of the island, has a stone monument indicating that it is the westernmost place in Japan, and it is a popular tourist attraction to visit. 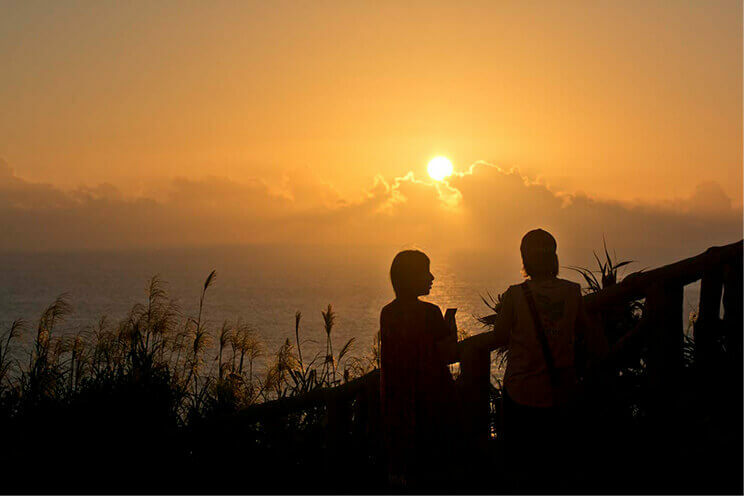 This is the location to view the last sunset in Japan. The time spent watching the sun set quietly as it paints everything beyond the horizon in madder red is a special moment that can only be experienced by those visiting the island. 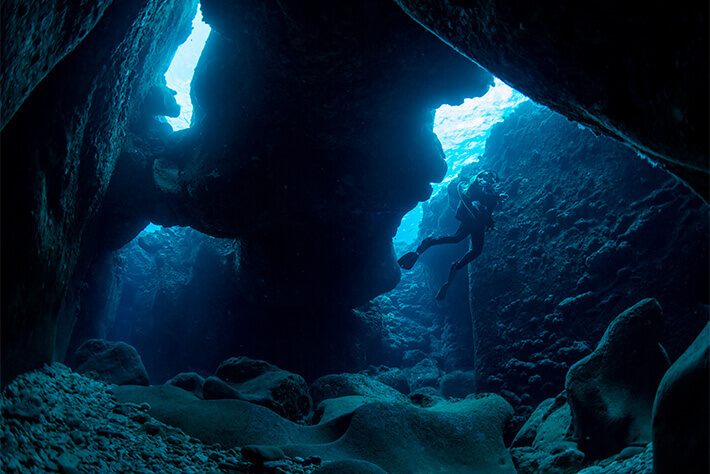 The sea surrounding Yonaguni is known for being one of the few places in the world to encounter hammerhead sharks. There is even a chance to see a group of over 100 hammerheads swimming, especially off the southern coast of Irizaki, the western end of the island, which divers worldwide yearn for. 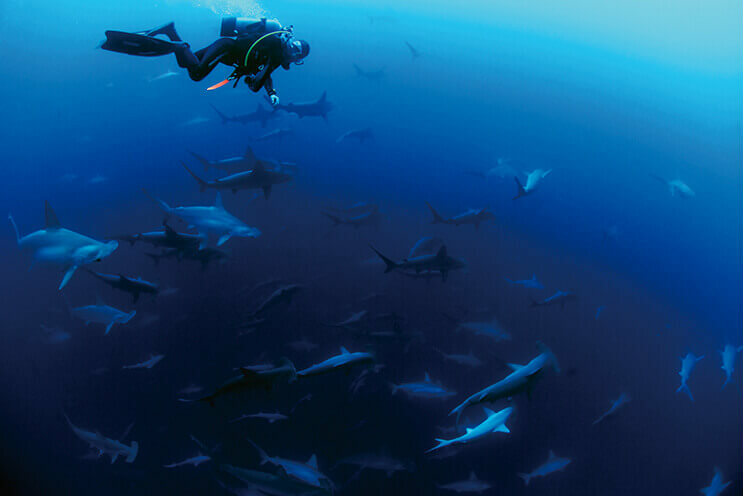 The high probability of encountering hammerhead sharks comes during the winter season between November and April, and with other popular spots like the Underwater Ruins, Light Palace, and Double Arch, many divers visit the island throughout the year. 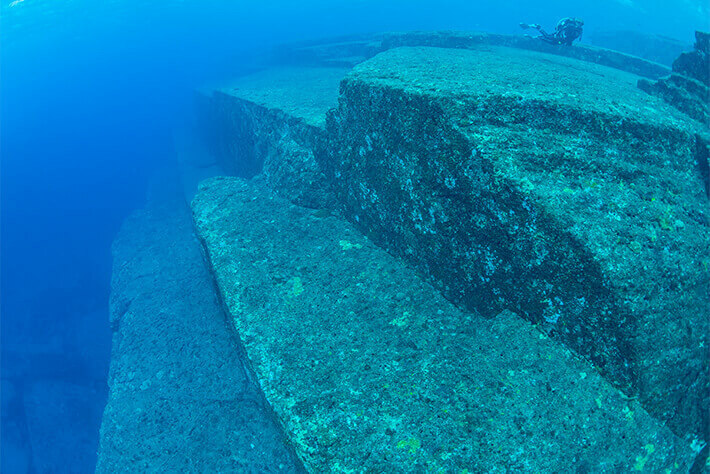 A group of megaliths lying on the seabed of Yonaguni Island hav a total length of approximately 100 meters, a width of approximately 60 meters, and a height of approximately 25 meters. How the mysterious topography of steps, stone pillars, and other structures that appear to be manmade were formed remains under investigation. While there has been a map created with names assigned to each spot, there are supposedly other unknown features as well. Were they naturally formed or built by hand? 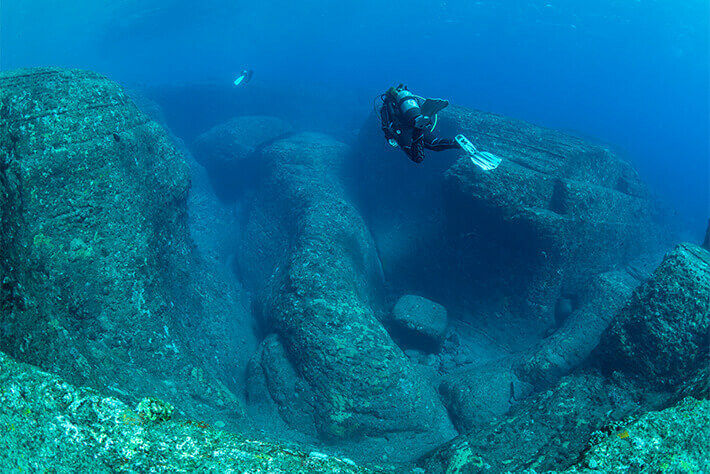 On Yonaguni Island, you can enjoy this mysterious underwater landscape by going on a diving tour or taking a tour on an underwater sightseeing boat. * Flights are applicable to change, so please contact the airline for more information. Ishigaki Port / Fukuyama Kaiun Ferry Terminal > Kubura Port (Yonaguni island). Approx. 4 hours by ferry. Service operates on Tuesdays and Fridays. Size / Population: 28.91km² / Approx population of 1,500.